Your child is growing in confidence, capability and creativity through hands-on experience. Our curriculums introduce your child to a vast array of Montessori and manipulative materials, allowing him or her limitless learning opportunities. Your child absorbs critical concepts in math, language, reading, science, geography, art and more, through self-motivated exploration, examination and repetition. Reading and writing are key elements throughout the program, and in our kindergarten curriculum, students build comprehension skills during group and individual lessons. 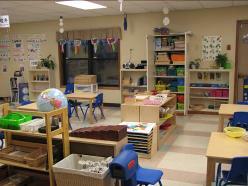 Children of all ages engage in purposeful actions with practical life and sensorial materials. These activities help develop strong work habits, coordination and concentration, as well as organization, personal capability and independence. Montessori elements are designed to feed the natural curiosity of children, helping them learn to learn.